A baby had its details held on the controversial DNA police database, Jacqui Smith has confirmed. The home secretary said the youngest person to have a DNA profile held on the database was less than a year old and the oldest was over 90. It is understood the sample would have been taken to eliminate the baby's DNA from a crime scene. Liberal Democrat home affairs spokesman Chris Huhne said it was "ludicrous" to have stored the DNA profile. He said: "It is illegal, immoral and ineffective to keep the DNA of a baby on a national police database as if they had committed some felony. "The sooner the home secretary implements the European Court's ruling that our DNA database contravenes the right to privacy, the better." 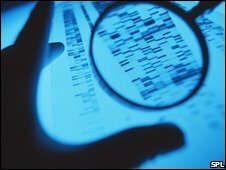 In December the European Court of Human Rights ruled the UK should not indefinitely retain the DNA and fingerprint records of people who were not convicted of a crime. Following that ruling, Ms Smith announced changes to the way the database operated - and said the government would take "immediate steps" to remove the DNA profiles of children under 10 from the database. The baby's profile is understood to have been taken before the changes were announced. Since then DNA profiles of children under 10, taken with consent for "elimination purposes" - to compare with samples taken at crime scenes - are deleted, the government says. A Home Office spokesman said: "The use of DNA in investigations is one of the breakthroughs for modern policing. The strength of the DNA database can only be safeguarded if it has the confidence and trust of the public. "That is why the home secretary made clear in December that the government would take immediate steps to remove children under 10 from the DNA database. All necessary steps have been taken to fulfil this." He added there would be a Forensics White Paper this year setting out further proposals "demonstrating a proportionate and fair approach to the use of forensics". Nearly a million people with no criminal record have their details held on the database - which holds 4.5 million profiles and is thought to be the largest in the world.